Some people appreciate when others try hard, but for some this can be exhausting. Trying hard is a sign of caring but it can also show insecurities in some ways, and this isn’t always appealing to some people. 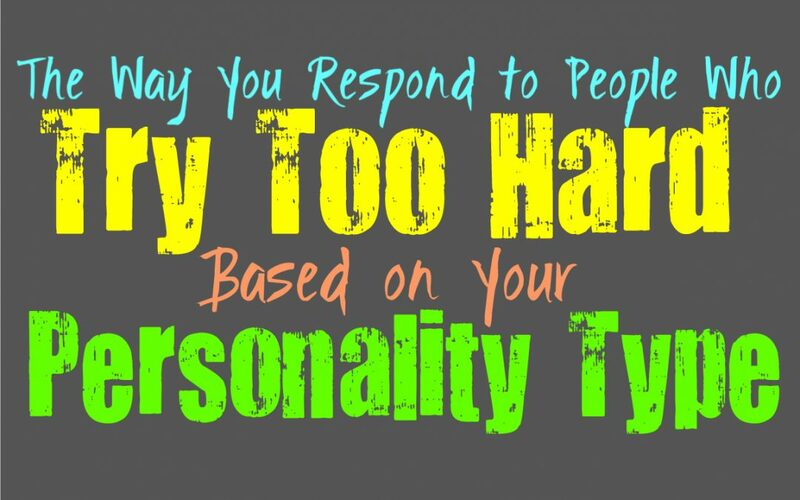 So here is how you respond to people who try a bit too hard, based on your personality type. For the INFJ it often depends more on the individual than a broad view of their actions, and so in some cases they don’t mind when someone tries too hard. When it is someone the INFJ cares for and even admires, then they might even appreciate their efforts. They can find it a bit endearing when someone put forth a lot of effort, and even if they are bit foolish doing so. When someone the INFJ doesn’t like seems to try too hard, they can see this as someone tries to deceive others. Their response to going overboard with things, entire depends on the individual. ENFJs can appreciate when someone is trying a bit too hard, especially if it is someone with an honest heart. They try not to be hard on someone who is simply doing their best, especially if it comes from a place of caring. When their loved ones are trying a bit too hard the ENFJ will do their best to stand by them. ENFJs want to settle people and help them feel more comfortable in their own skin, so they don’t have to feel the need to try so hard all of the time. At the same time they do appreciate when someone is trying for them, since they can struggle to find people who appreciate them in this way. INFPs can become a bit uncomfortable with some people who try too hard, especially if that person is insincere. They value honestly and want to be around people who are simply being themselves. If someone tries too hard because this is who they are, then the INFP will do their best to become comfortable with this behavior. They appreciate people who have big hearts and who are simply trying their best to care for others. While INFPs can appreciate this, sometimes because around people who try too hard can feel a bit draining after a while. ENFPs can become a bit overwhelmed by people who try too hard, and might even feel drained by this after a while. While they appreciate when someone cares enough to try, sometimes it can be a bit too much for them. ENFPs care about others and want to please them in some ways, but at the same time they do enjoy a little bit of a challenge. Someone who is incapable of showing confidence in themselves to the point where they are constantly trying too hard, can be a bit unappealing for them. INTJs don’t often handle people who try too hard all that well, since this can become draining for them. Someone who constantly tries too hard often has an overwhelming energy, which isn’t something INTJs enjoy about around. They need space and prefer to be around people who are more confident than this. INTJs find themselves drawn to a sense of confidence and prefer people who are sure of themselves. While they appreciate effort and consideration, someone who tries too hard just isn’t appealing for them. ENTJs don’t usually feel comfortable around people who try too hard, since this can become draining for them. They need space to get things done and would rather someone who is confident in themselves and their abilities. Someone who is constantly trying too hard, is often a bit insecure with themselves or their relationships. This type of attitude can be a bit draining for ENTJs and if they care about this person they will want to help them adjust this behavior in some ways. For INTPs someone who tries too hard can sometimes throw them off, and it might feel insincere. They don’t mind people who put forth a lot of effort for the ones they love, but can struggle to differentiate sometimes. INTPs aren’t great at understanding the emotions of others, and so someone who tries too hard can confuse them a bit. When people are constantly trying to make things right and happy, it can make the INTP feel doubtful of this person’s sincerity. ENTPs don’t mind when someone tries too hard, but this often depends on the specific person. Someone they care for and appreciate is going to get more leeway with this sort of behavior. Most of the time ENTPs do prefer people who have more self-confidence and aren’t constantly trying too hard to please others. They understand that some people simply want to make others happy, but this can become draining after a while. They will do their best to become more at ease with this behavior, or find ways to shut it down when needed. ISTJs can become rather drained by people who try too hard, since this type of behavior can be a bit too much. Someone who is constantly trying too hard rarely gives the ISTJ the space that they need. They prefer people who are confident and even a bit quiet, since this helps them get the time alone they need. For ISTJs a sense of confidence is more appealing than someone who is constantly seeking out reassurance and trying too hard to impress people. ESTJs can become drained by someone who tries too hard, since it often requires more attention than they are willing to give. They can appreciate when people just want to impress and please them, but it can be a bit too much after a while. The ESTJ will do their best to calm this person and help them find a bit more confidence in themselves, but this isn’t always easy to achieve. ESTJs can become overwhelmed by people who feel a need to constantly try too hard, but they appreciate if this person can at least achieve what they are striving for. ISFJs don’t usually mind when someone is trying too hard, since they appreciate effort. They often enjoy when someone cares enough to try, even if they are trying a bit too hard. ISFJs care about others and are sensitive to their emotions, so they can often sense when someone is being sincere. If someone is trying hard to a point where others might think it is a bit too much, the ISFJ often appreciate this and sees that they have a good heart. ESFJs often appreciate people who try a bit too hard, even if it can become draining sometimes. ESFJs are sensitive to the emotions of others, and so sometimes this can make it difficult when someone is constantly trying too hard. They can feel these emotions and will feel the need to constantly reassure that person in order to ease their anxiety. This can feel like a full time job for the ESFJ sometimes, and so even though they try to be patient it can be a bit overwhelming. ISTPs don’t mind when someone is trying too hard, but they might not want to be around that person all of the time. They need space to themselves and someone who is trying too hard often needs more reassurance than they are willing to give. For ISTPs being around people who are needy or clingy can be truly exhausting after a while. They need space to themselves and can’t really handle someone who requires a lot of attention and reassurance. ESTPs often prefer a bit of a challenge, and so someone who is trying too hard is usually unappealing to them. They can even become annoyed with someone who is constantly trying too hard and in need of their reassurance. ESTPs prefer people with confidence who are capable of handling things themselves. Clingy behavior can be truly exhausting for them, and usually isn’t something they want to be around all that much. They will often be nice to these people, but that doesn’t mean they want to be close to them. ISFPs don’t mind people who try too hard, especially if they are being sincere. They want to be supportive of their loved ones, and don’t like making them feel bad about their insecurities. ISFPs are understanding and moral people, who can appreciate when someone is simply trying their best. Someone who tries a bit too hard is often better than someone who just doesn’t care at all, especially for the ISFP. ESFPs can certainly appreciate when someone cares enough to try, and so usually they can handle someone who goes a bit too far. For the ESFP someone who at least goes after what they want and gives it their all, is valuable. They care about their loved ones and simply want to feel appreciated and cared for. When someone they love puts forth a lot of effort, the ESFP might become drained by this but they do their best to understand it.